Today, the Congress Commemorative Silver Dollar Coin remembers when they decided to tax household goods annually including furniture and gold and silver watches on January 18, 1815. Though, it was repealed just over a year later. Chap. XXIII.— An Act to provide additional revenues for defraying the expenses of government, and maintaining the public credit, by laying duties on household furniture, and on gold and silver watches. If not exceeding four hundred dollars, one dollar. If above four hundred and not exceeding six hundred dollars, one dollar and fifty cents. If above six hundred and not exceeding one thousand dollars, three dollars. If above one thousand and not exceeding fifteen hundred dollars, six dollars. If above fifteen hundred and not exceeding two thousand dollars, ten dollars. If above two thousand and not exceeding three thousand dollars, seventeen dollars. If above three thousand and not exceeding four thousand dollars, twenty-eight dollars. If above four thousand and not exceeding six thousand dollars, forty-five dollars. If above six thousand and not exceeding nine thousand dollars, seventy-five dollars. If above nine thousand dollars, one hundred dollars: which duty shall be paid by the owner of the said household furniture. That there shall be, and hereby is, likewise imposed an annual duty of two dollars on every gold watch kept for use, and of one dollar on every silver watch kept for use, which duty shall be paid by the owner thereof. Sec. 2. And be it further enacted, That whenever lists of property shall hereafter be taken in any collection district, under a general assessment therein by the assistant assessors, as required by the “Act for the assessment and collection of direct taxes, and internal duties,” passed July the twenty-second, one thousand eight hundred and thirteen, or by any other act, passed or to be passed, lists of the value of the household furniture, as classed by the first section of this act, with the number and description of watches, within such collection district, belonging to each person therein taxable as aforesaid, with the name of the owner or agent, shall be made out in writing by such person or his agent, and delivered to the assistant assessor, at the time of his application therefor, which shall be the same time as that prescribed in the act then in force, for the delivery of the lists therein required to be delivered; and the said assistant assessor is hereby empowered and directed to apply therefor at the dwelling of said person, or his agent, at the said time. Sec. 3. And be it further enacted, That, if any person or agent, as aforesaid, shall not be prepared to exhibit a written list when required, and shall consent to disclose the value of any and all the said household furniture, and the number of watches, as aforesaid, in such case it shall be the duty of the assistant assessor to make such list, which being distinctly read and assented to, shall be received as the list aforesaid of such person, and be certified as such by the said assistant assessor. Sec. 4. And be it further enacted, That if any such person or agent shall deliver or disclose to any assessor any false or fraudulent list, with intent to defeat or evade the purposes of this act, such person or agent shall forfeit and pay the sum of one hundred dollars, to be recovered in any court having competent jurisdiction. Sec. 5. And be it further enacted, That in case any person, whether owner or agent as aforesaid, shall be absent from his place of residence at the time an assistant assessor shall apply to receive the list of such person, it shall be the duty of such assessor, to leave at the house or place of residence of such person, a written note or memorandum, requiring him to present to such assessor the list aforesaid, within ten days from the date of such note or memorandum; and if any person, on being notified or required as aforesaid, shall refuse or neglect to give such list as aforesaid, within such time, it shall be the duty of the said assessor, to make, according to the best information which he can obtain, such lists, which lists, so made and subscribed by such assessor, shall be received as the lists aforesaid of such person; and the person so failing or neglecting, unless in case of sickness or absence from home, shall, moreover, forfeit and pay the sum of fifty dollars. Sec. 6. And be it further enacted, That the several assistant assessors in each of the said collection districts shall deliver the lists aforesaid to the principal assessor, within the time prescribed by the thirteenth section of the “Act for the assessment and collection of direct taxes and internal duties,” passed twenty-second of July, eighteen hundred and thirteen, for the delivery of the lists therein designated: Provided, That if the said time be altered by any act subsequently passed, such delivery shall be within the time last prescribed therefor. Sec. 7. And be it further enacted, That the respective principal assessors shall make out, according to the lists received from the assistant assessors, a general list or lists of all persons taxable as aforesaid, specifying the name of the owner or agent, the valuation of the household furniture, with the number and description of the watches as aforesaid, and the duty payable on each; which list or lists shall be made out in alphabetical order, for each county or smaller division of a collection district, as may be directed by the Secretary of the Treasury. Sec. 25. And be it further enacted, That towards establishing an adequate revenue to provide for the payment of the expenses of government; for the punctual payment of the public debt, principal and interest, contracted and to be contracted, according to the terms of the contracts respectively; and for creating an adequate sinking fund, gradually to reduce and eventually to extinguish the public debt, contracted and to be contracted, the duties laid and imposed by this act shall continue to be laid, levied, and collected, during the present war between the United States and Great Britain, and until the purposes aforesaid shall be completely accomplished. Provided always, That whenever Congress shall deem it expedient to alter, reduce, or change the said duties, or either of them, it shall be lawful so to do, upon providing and substituting, by law, at the same time and for the same purposes, other duties which shall be equally productive with the duties so altered, reduced, or changed. Chap. XLI. — An Act to repeal the act, entitled “An act to provide additional revenues for defraying the expenses of government and maintaining the public credit, by laying duties on household furniture and on gold and silver watches. Be it enacted by the Senate and House of Representatives of the United States of America, in Congress assembled, That so much of the act, entitled ” An act to provide additional revenue for defraying the expenses of government and maintaining the public credit, by laying duties on household furniture and on gold and silver watches,” as lays a duty on household furniture, and on watches kept for use, in the year one thousand eight hundred and sixteen, and in succeeding years, shall be, the same is hereby, repealed. 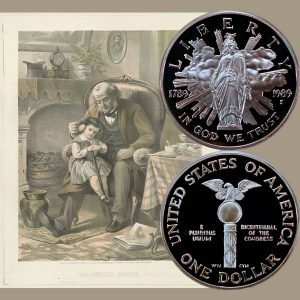 The Congress Commemorative Silver Dollar Coin shows with an artist’s image of a grandpa and his watch.